A smooth and soft textured skin is considered to be healthy and attractive. We all try and take care of our skin as much as possible to ensure it stays free of blemish and retains your youthful good looks. Although there are hundreds of skin care treatments available in the market today, there is not a single one of them which suits all. There are often undesired side effects of using some of these over-the-counter skin care solutions too. To remedy this, and retain your flawless skin, cosmetic skin peel technique is one of the most popular and effective ones. What is cosmetic Skin Peel? Cosmetic skin peel helps to improve your skin’s appearance. In this, a particular chemical is used to remove the unhealthy skin and dead cells from the upper skin layers which is then replaced naturally with healthy, new skin. This is a completely non-surgical and non-invasive cosmetic solution to get smooth, flawless skin in a short time. Am I an ideal candidate for cosmetic Skin Peel? Cosmetic skin peel technique is fairly simple and there are only a few guidelines that dictate selecting the best candidates for this procedure. You have fine lines around your mouth and eyes. You wish to get treatment for wrinkles that are the result of ageing or damage from sun. You wish to improve the appearance of scars that are mild to look at. You wish to get certain types of acne treated. You wish to reduce the freckles, spots and dark melasma patches from birth control pills and pregnancy. You wish to improve the overall feel and look of your skin. You have a fair complexion. You have overall good skin quality and do not have excessive sagging skin and severe wrinkles. How is cosmetic Skin Peel performed? Cosmetic skin peel procedures are performed as outpatient procedures as these are non-surgical and non-invasive in approach. Before starting the procedure, the cosmetic specialist will clean the targeted areas of your skin thoroughly. Then, one or more chemical are applied gently on to the targeted areas. Cosmetologists usually choose to apply lactic acid, glycolic acid, carbolic acid (phenol), tricholoacetic acid or salicylic acid. These chemicals are aimed to form blisters of the uppermost skin layers of the targeted areas. These blisters immediately burst, causing the skin to be destroyed in the process. Following a natural process, the wounds are immediately covered with a new skin by your body. This new skin is smoother, healthier and looks attractive too. Although you may feel a slight burning sensation during this procedure, the feeling normally disappears after 5-10 minutes. Putting a cool compress on the treated skin helps to alleviate any remaining discomfort from the treated area. The cosmetologist may also advise specific oral or topical medications in case you have undergone an intensive and deeper skin peel procedure. At Cocoona Center for Aesthetic Transformation, our team of skin specialists and cosmetic surgeons is able to provide cosmetic procedures of international standards. 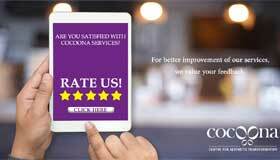 Thanks to our collective vast expertise and the advanced equipment in use at Cocoona, we are able to give the best, most effective and affordable cosmetic skin peel in India.